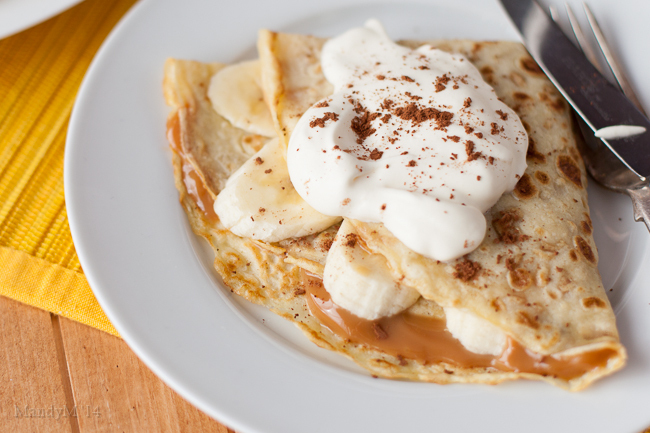 Banoffee Crepes — What the Fruitcake?! Pancake Day is around the corner and this year I thought I'd get into the spirit of things. This is my second Shrove Tuesday since moving to Ireland but last year it came and went without me really taking any note of it. To be honest, I'd never heard of it before. Last year, a couple of weeks before Pancake Day, I noticed shelves filled with instant pancake mixes, lemons, syrup, honey, whipped cream, basically anything pancake related. I'm not sure who I asked or where I found out it was all about Pancake Day, but by then it was over and I didn't really pay any attention to it. Basically, the simplified version of it is: getting all you can eat of all the things you shouldn't before Lent starts. Enough said. I say bring on Pancake Day! Something else I don't recall having in South Africa is banoffee pie. When Andrew and I were still doing the long distance thing, I'd fly up to Ireland to visit him, and when we went out for a meal there was normally banoffee pie on the dessert menu. My first encounter with it. A very simple dessert, simply a sweet crust, caramel, fresh banana slices and whipped cream. This decadent dessert came to mind when I was thinking of fillings for pancakes, it was the perfect partnership, not just 'cause I imagined it would taste great, but because I associate Pancake Day and banoffee to me being in Ireland. And as for banoffee pancakes, they are as fantastic as I imagined! Posted on February 13, 2010 by Mandy Mortimer and filed under Cooked, Sweet and tagged Banana Caramel Cream Crepe Dulce de Leche Pancake Pancake Day South African Recipe.